She wakes up about 6:45, has a bottle and gets her diaper changed. Then from about 7:15-7:45 she “helps” dad get ready while I grab a quick shower. 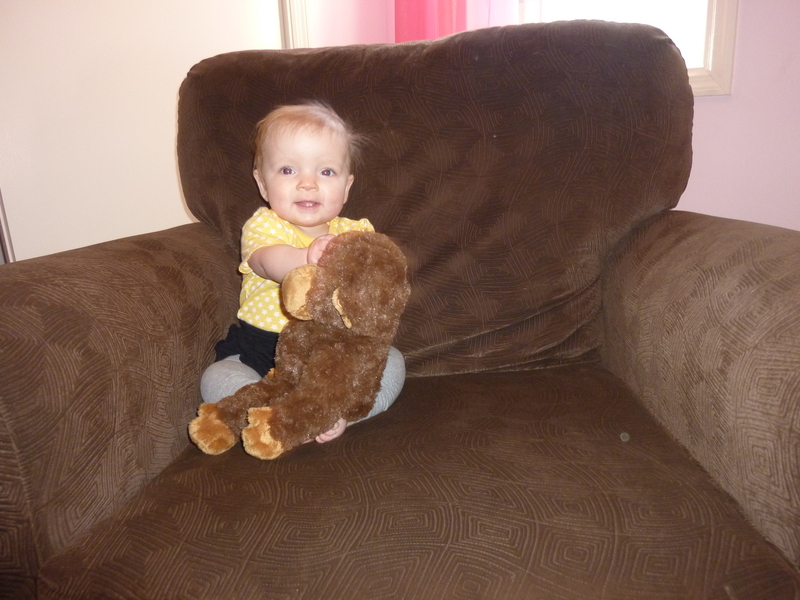 From about 8:15 – 9 we attempt to play, usually in her playroom. At 9, I change her diaper, get her dressed for the day and we load up to go to daycare. Here’s where the “Mom, you’re so boring! !” part comes in. The 8:15 – 9 segment of our day is usually spent with Miss Chloe crying and fussing after just a few minutes. It doesn’t matter what we’re doing, she just seems to hate it after a few minutes. If however, I get her dressed early and we go on a ‘field trip’ – to the hotel to see dad and Nanna, to my office to see the ladies or even just to Target – she’s happy as a clam. Whenever she’s had a particularly cranky morning, I like to inform daycare. But no sooner have I gotten the words “She’s a little cranky today” out of my mouth before she’s waving and smiling at Rendee and Clara and talking and playing with her friends. Chloe has never been a great sleeper. I can’t say I don’t deserve this – my mom tells me I didn’t sleep through the night until I was 4. I can only hope that that’s not what we’re facing!! There are nights when we can see the light at the end of the tunnel, where we think that maybe, just maybe, she might be figuring out this whole sleep thing. 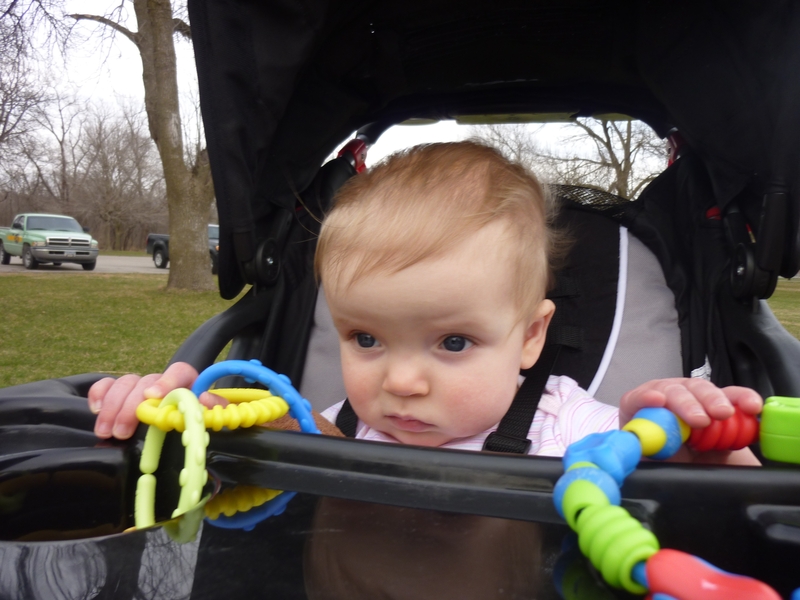 Then, inevitably, she gets a cold, starts teething, we stay out past her bedtime, she figures out how to crawl, bedtime changes because of daylight savings….something happens that messes with her sleep. This week it’s a cold/ear infection/teething. We’re up many, many times a night. I’m lucky to have a wonderful husband who gets up many of the many, many times. But….I’m still exhausted and usually half asleep and zombie-like when I go in to get Chloe back to sleep. At about 4AM last night she was crying, so in I went. As I got into her room, I couldn’t figure out where she was!! Common sense would suggest that since I could hear her screaming I’d know she was there. She can’t pull herself up to standing, let alone climb out of her crib, so, again, you’d think I’d know she was there. But it was the middle of the night and I was half asleep, so I couldn’t find my screaming baby curled up in the corner of her crib. I’m sure it was really only about 2 seconds before I spotted her, but considering that I knew she had to be within about 8 square feet, I felt pretty silly that it took me that long even. 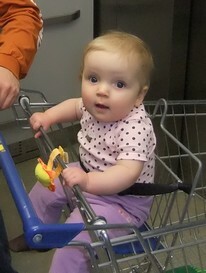 In my sleep-deprived defense, she normally scoots down to the bottom of her crib and instead had moved up to the top…. Okay, it’s still pretty sad. I think we all just need a good night’s sleep!! Our sweet little baby girl is hardly a baby anymore. I don’t know if it’s the double digits (10 Months) or because of all the new things she’s doing now, but Chloe Mae seems like such a big girl all of a sudden!! She’s figured out how to crawl. For the first few days, she used a foot to push herself forward and the other leg was just along for the ride. 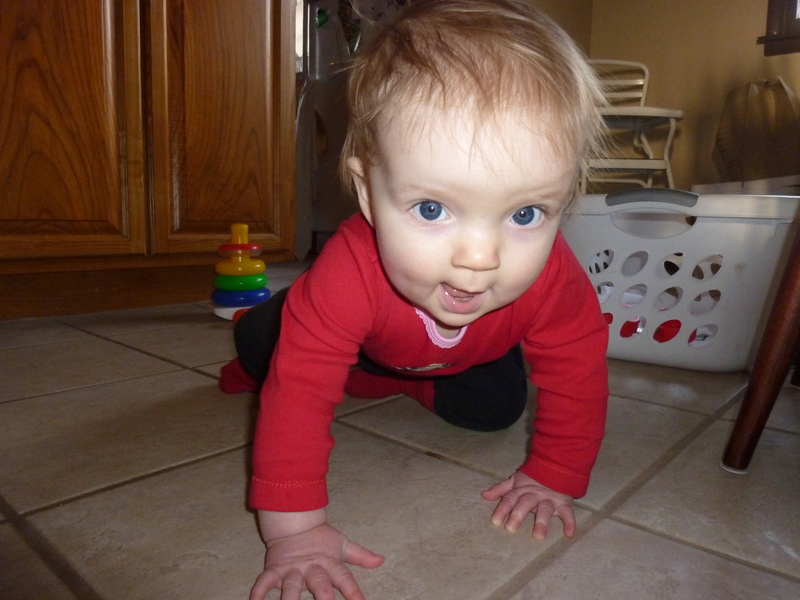 She seems to be getting the traditional crawling motion down now, but it’s still slow going. She has yet to crawl to mom or dad (because if she cries enough, we’ll just go get her…) but she’ll get moving when she wants something – like the TV remote or my cell phone. Chloe had a late lunch at daycare earlier this week, so they didn’t sit her down at the table for snacktime. She wasn’t a fan. So she crawled over to the table and tried to pull herself up to snag some snack from a friend. Her efforts were rewarded with some delicious oyster crackers. 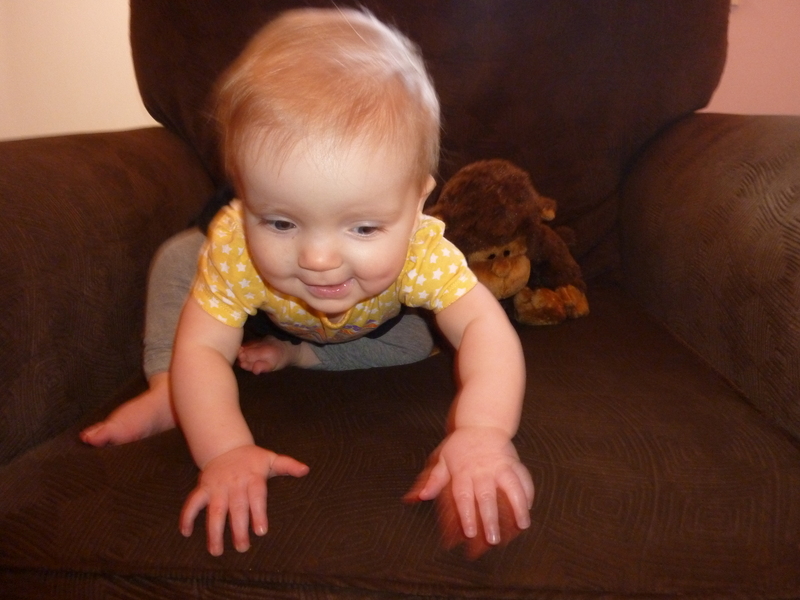 At the same time she figured out how to crawl, she started taking steps while holding onto our hands. Previously, she would just lean forward and act like her feet were cemented to the ground, so it’s pretty cute to see her little legs flailing around. She’s trying to pull herself up, but has only made it as far as her knees. In the last few days she’s been cutting a top tooth. It took us a while to figure out that’s what was going on, and she’s much happier now that we know what’s going on and can try to alleviate her discomfort. It’s been a few months since her bottom teeth came in, but I’m guessing they’ll be coming in more frequently now, so hopefully it won’t take us a couple days to figure out why she’s upset each time!! Feeding Miss Chloe Mae has been slightly less challenging. She doesn’t fight us as much or require a Puff for every bite off a spoon. Now she just wants more variety. After 5 or 6 bites of something she wants to move on to something new. Providing variety is a lot easier than fighting her on every bite, so we’ll take it!! She’s getting better at drinking water out of a sippy cup, but hasn’t figured out to swallow the last of the water before she takes the cup out of her mouth, so it’s a very wet process!! She still loves to stack her rings and also likes playing with some nesting cups we got her. We had a laundry basket with about 6 washcloths in it sitting in our dining room for a few days, because she thought taking the washcloths out and then putting them all back in was great fun. She seems to enjoy being read to and looking at books more, so we’re trying to spend more time doing that every day. I’m excited for garage sale season to start in hopes that we can find lots of new-to-us, cheap board books. We did eventually get a good one. But not before several pictures like this. My current library book was on our bed yesterday. As soon as I plopped Chloe down on the bed, she lunged forward, used her amazing little pincer grasp and yanked my bookmark out of the book. Then she held it up, like the prize it was, and shot me her cutest dimpled grin. I tried to get the bookmark back from her, so I could put it back before I forgot where I was, but she had her white-knuckled grip on it. As soon as I took her out to the kitchen, and she had a chance to show dad what she’d done, she let go. Chloe Mae cannot yet crawl. She doesn’t walk or cruise. Chloe has not slept through an entire night (although we’re getting closer) and she hasn’t said her first word. So, what has our 9.5 month old beauty done?? She’s started licking her reflection in the mirror. Isn’t that a milestone that all parents are waiting for? ?